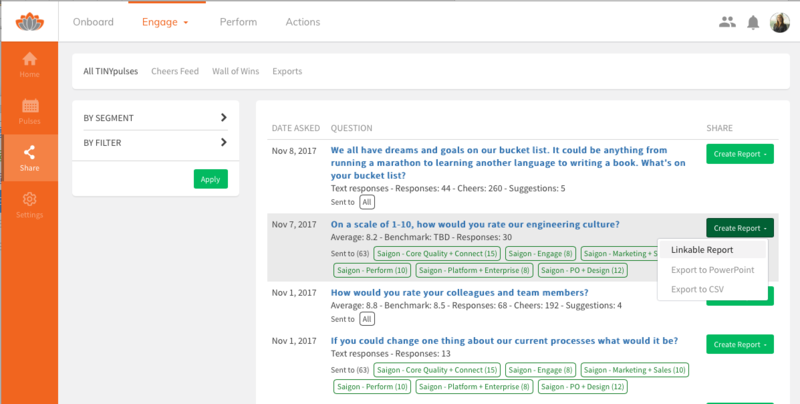 For those of you looking for even more ways to analyze and share feedback from your company's TINYpulse surveys, you can export results into a few different formats to share with your teams. Click Share on the left navigation menu of the Engage Dashboard to view an entire history of your TINYpulse survey results. Both company and segment pulses appear in the list. Select Create Report to share results via link, export to a PowerPoint presentation, or export to .csv. But you're probably wondering, which format is right for me? A linkable report will allow you to view the report, make edits, then share the results to your employees via URL. We always recommend holding a TINYpulse review meeting with your teams in person to open up channels of communication and promote transparency within your organization. However, if you're short on time one week, have remote employees, or want to follow up from your TINYpulse review meeting, sharing the URL is a good option. Just copy the link and send it to whomever you wish. Please note that the link is public and anyone with it will be able to view the results. The PowerPoint export is perfect for executives and directors who want an overview of the company's TINYpulse survey results without digging into the details. You'll see information like a snapshot of the survey results, the last thee Wins, etc. Having a pre-built presentation at the touch of a button will save admins tons of prep time TINYpulse and make it easier than ever to present results to your teams. Export to a .csv file if you want to analyze the data in house and create your own charts and presentations. Analysis does require more work but some companies prefer deducing their own insights from the raw data. The .csv export produces eight individual files to help you analyze all aspects of your survey results. If you're looking to export all Engage data from the day you started pulsing, head on over to Users and Settings -> Exports and select the Export All option. From here, you can decide which items you'd like to export such as responses, suggestions, comments, Cheers, etc. Select them all for an entire data dump from TINYpulse Engage. Note that this export doesn't include Onboard, Exit, Perform, or user data. Also, this export option is only available to Engage Super Admins and Admins. Segment Admins can still export Engage data by survey for their segments in the Engage Dashboard on the Share page.